SS. 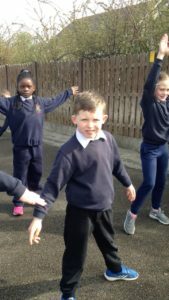 Michael and Peter had a fantastic time celebrating and taking part in Active Week. 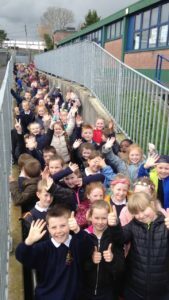 It was our first year taking part and we organised lots of fun events for the week. 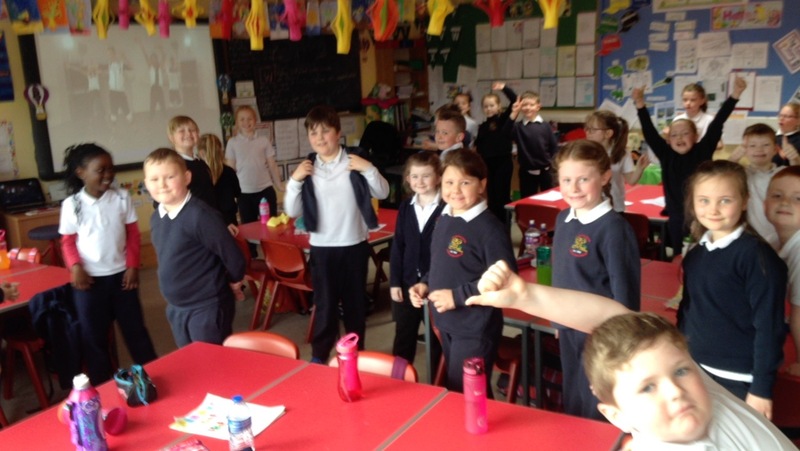 Three times throughout Tuesday we took part in Drop Everything And Dance. 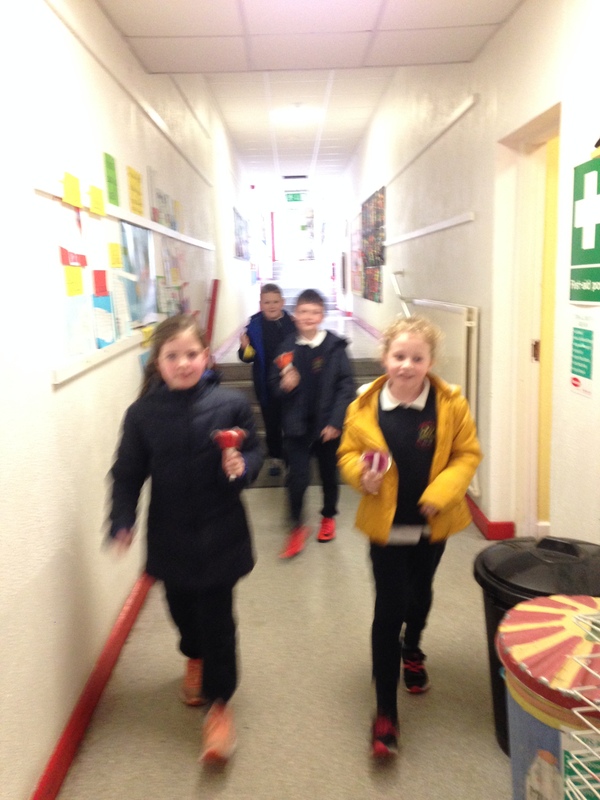 The committee members, Ally, Grainne, Alexander and Daniel ran through the school ringing bells to tell everyone it was time to DANCE! 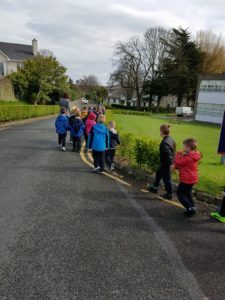 Wednesday: On Wednesday we had Walk On Wednesday. 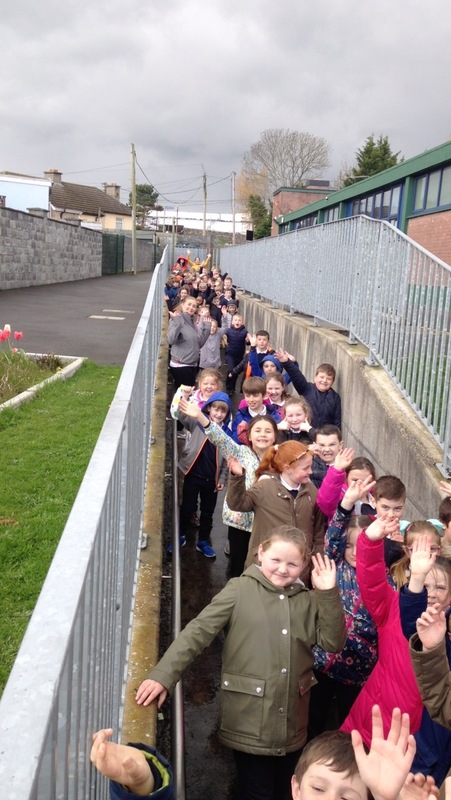 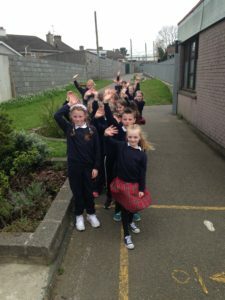 From Junior Infants to 2nd class we hiked off around the school grounds to take part in Walk On Wednesday. 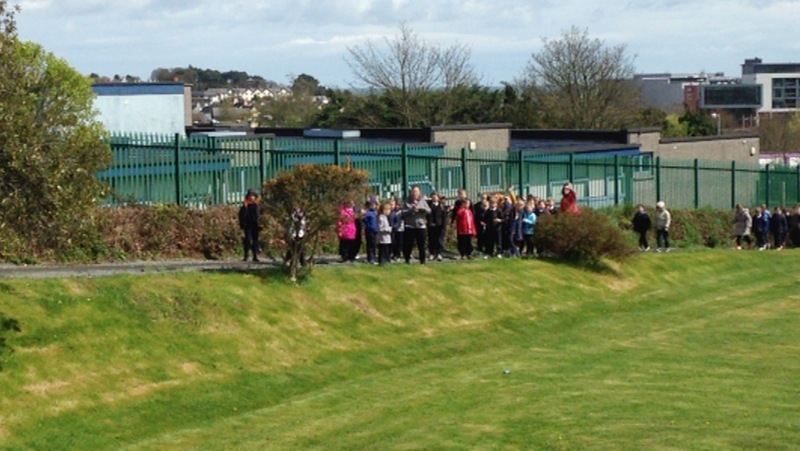 We definitely clocked up our steps!! 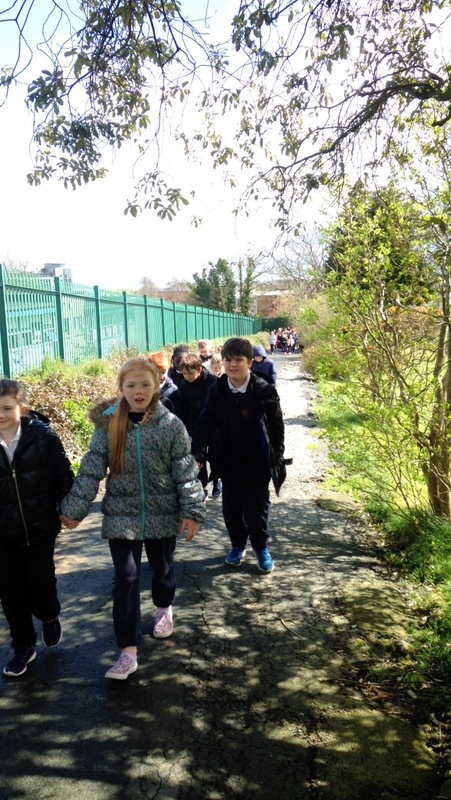 Walking around our school grounds was a great way to get some fresh air throughout the day and see some local nature too! 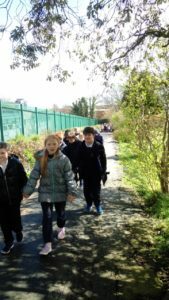 Sycamore trees lined our way as we took in all the beauty around us. 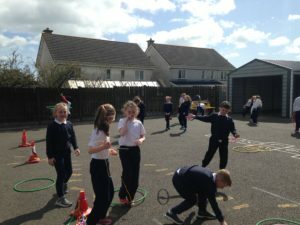 Thursday: Thursday was our Power Hour Sports Day. 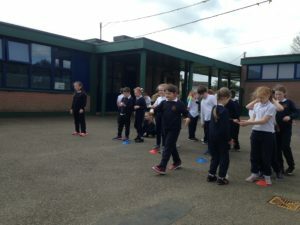 Off we went from 9.30am throughout the day to enjoy all the teachers had planned for our sports day. 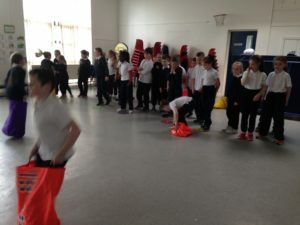 Races, relays, egg and spoon, parachute and many more activities. 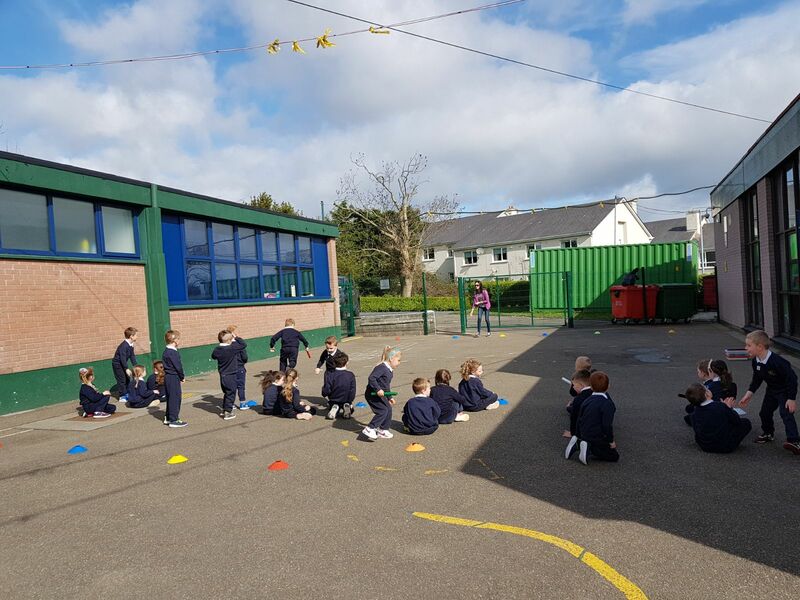 Adrian, our GAA Coach came in for the day and did mini skills with all the classes. 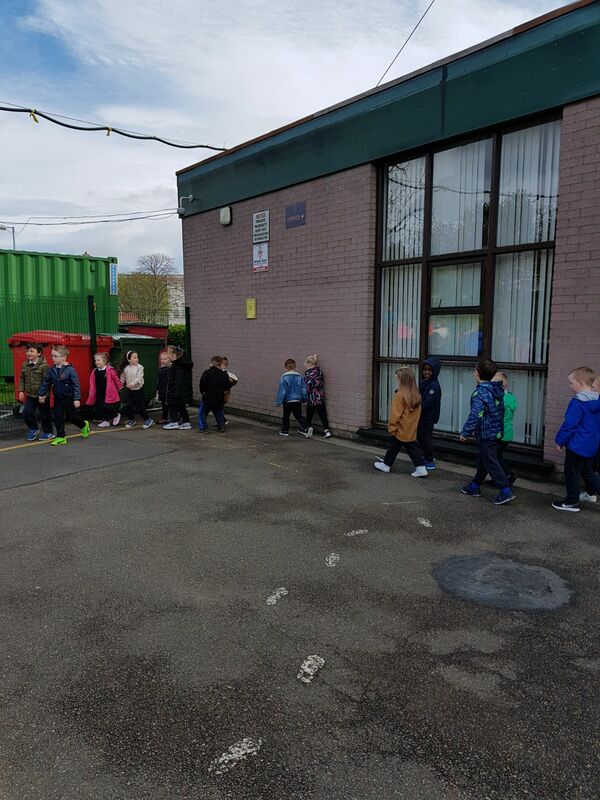 2nd classes took turns to lap the 2nd class yard throughout the week to see how many kilometers we could cover over the week. 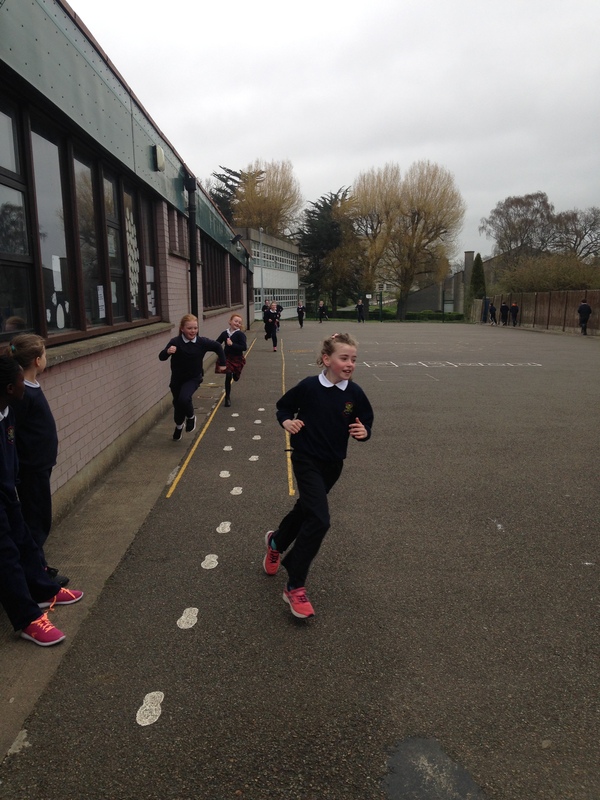 We decided to count the kilomteres and tell Mary Hickey all about Our lap of the map! All classes had a fantastic time taking part in Operation Transformation. We danced, discoed and dabbed our way through the few weeks to get fitter and healthier. 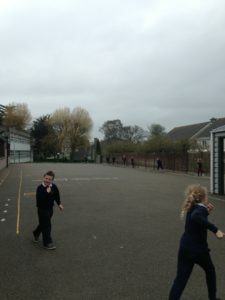 Every day at 10am we did our best to take part. 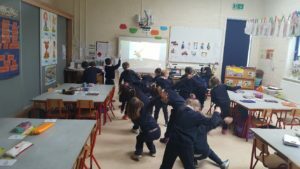 We loved following the team from RTE Junior in their routines to help us become healthier. 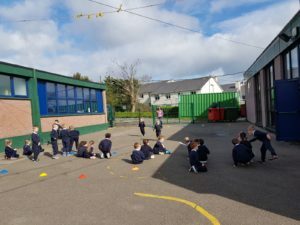 We are taking part in Operation Transformation in School this year. 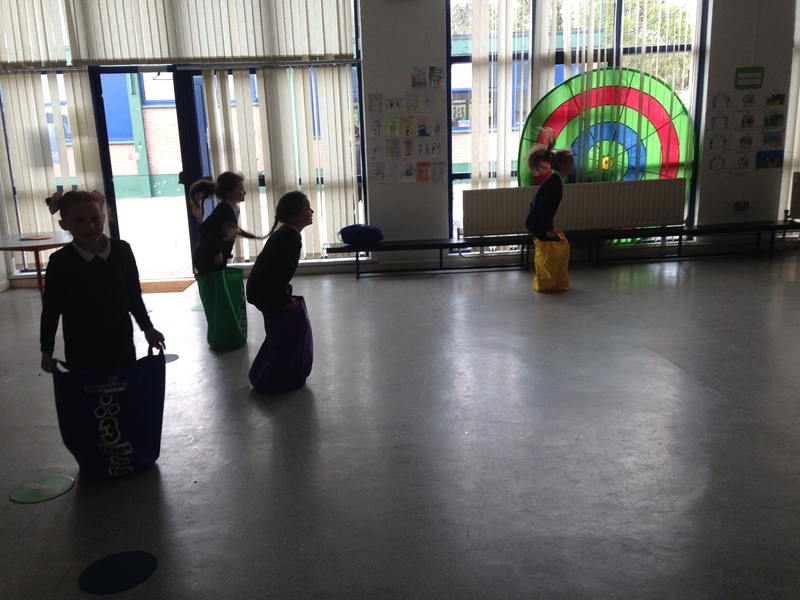 We will be following the leaders as they achieve their goals each week and maybe making goals for ourselves. 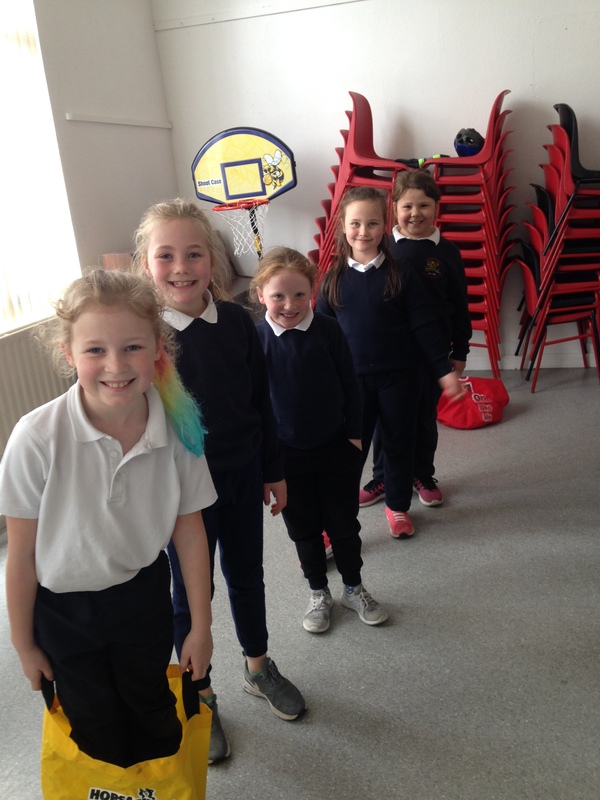 To support these leaders and have our own Operation Transformation, every class we will take part in 10 @ 10. Each class will have an ‘Active Break’ for 10 minutes to take part, it does not have to be at 10 am every morning, but a time that fits into each classes routine. 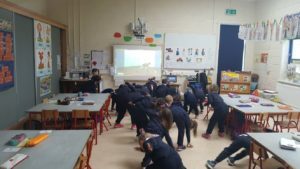 Our Committee members will be around to each class on the Monday of each week to remind each class to take part for the week. 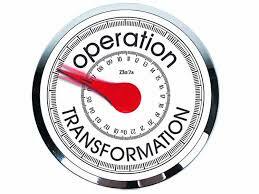 We will be starting on Monday 15th January and continuing for duration of Operation Transformation. 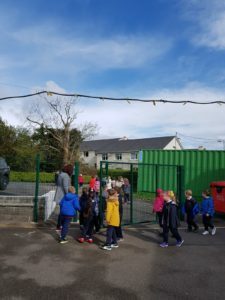 If you would like to follow at home, the link is below. 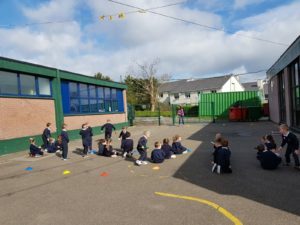 We have been Super Athletes in Ms. Bardon’s Senior Infants. We love being a part of our community and joining activities like Majorettes. 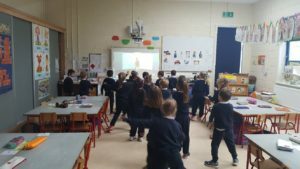 We are also great at being Active in our classrooms. 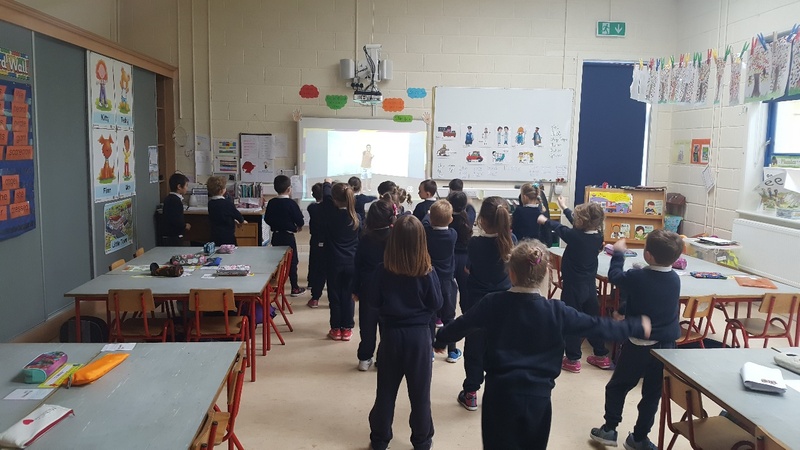 On Monday’s we make sure to be a little more active though and we do things like GoNoodle, 10@10 and Brain Breaks throughout the day. 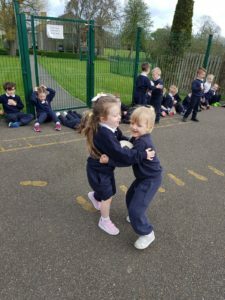 Check out some of our Cool Moves! 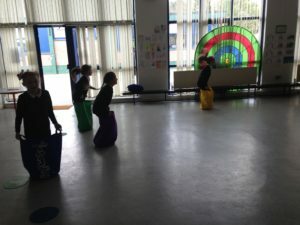 Over the course of the year we have been and will continue to implement and trial new ways to be active in and out of school. Movement Mondays – Every Monday the teachers give Movement Homework as part of their classes homework, this could be going for walk with someone, cycling your bike for 5-10 minutes or even playing Simon Say’s. Being active in school and at home are great ways to become aware of all the ways we can be active through all the sports and games that we like to play. 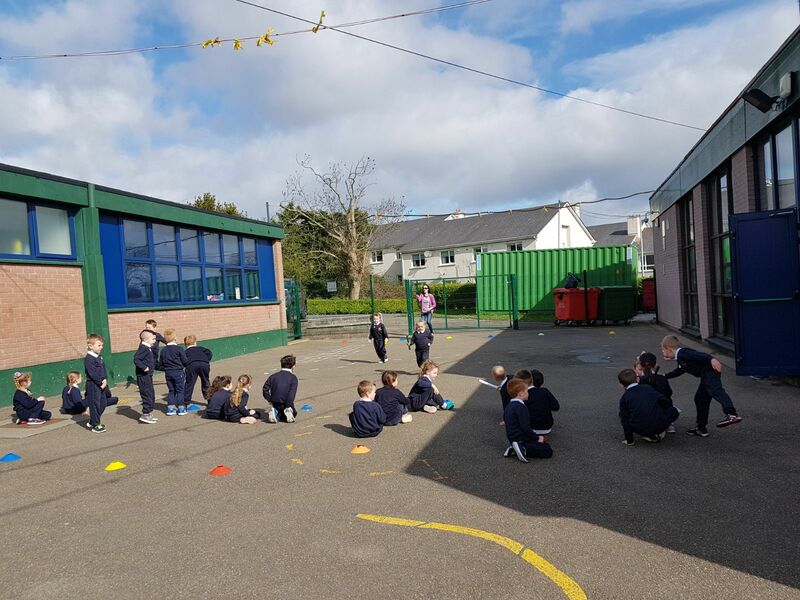 We will be organising an Active School Week in the new year along with following our local Marathon Runner Mary Hickey as she takes on a massive challenge with her Lap of the Map, where she is going to run the coast of Ireland to raise awareness and funds for the RNLI. We plan to follow Mary on her Lap of the Map in school, and see if we can keep up with her speed. Best of Luck Mary! Adhere to DES guidelines regarding PE timetable provision for all students. 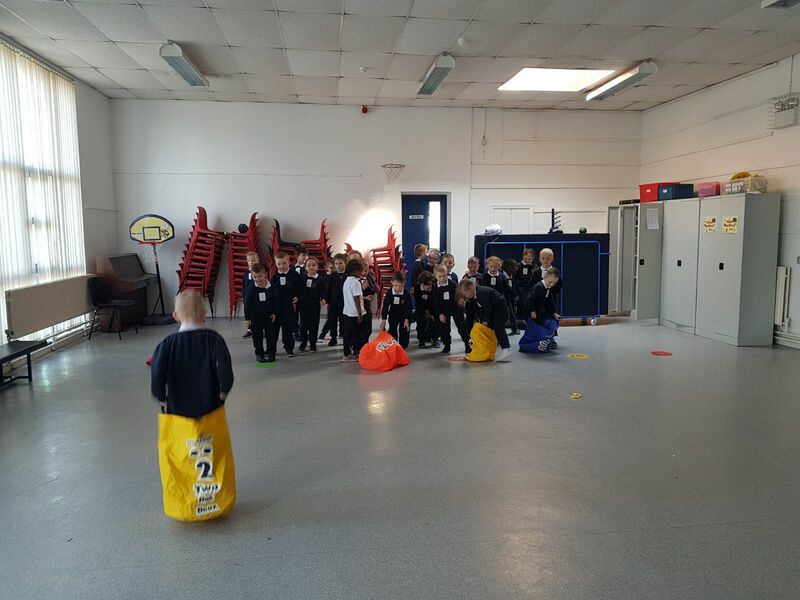 Teach a broad and balanced PE curriculum. 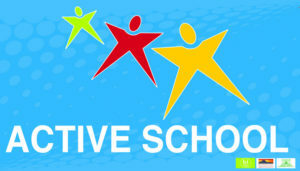 Inform and invite the whole school community to participate in the ASF process. Self-evaluate current provision in terms of PE, Physical Activity and Partnerships. 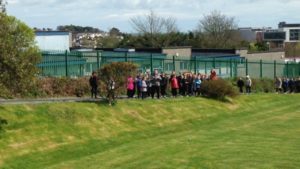 Plan, implement and monitor improvements for each of the aforementioned areas. 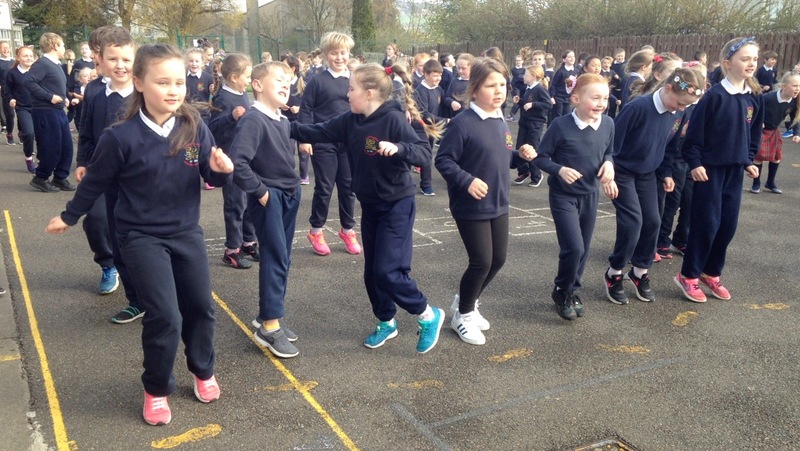 Organise an ‘Active School Week’ as part of the annual school calendar. 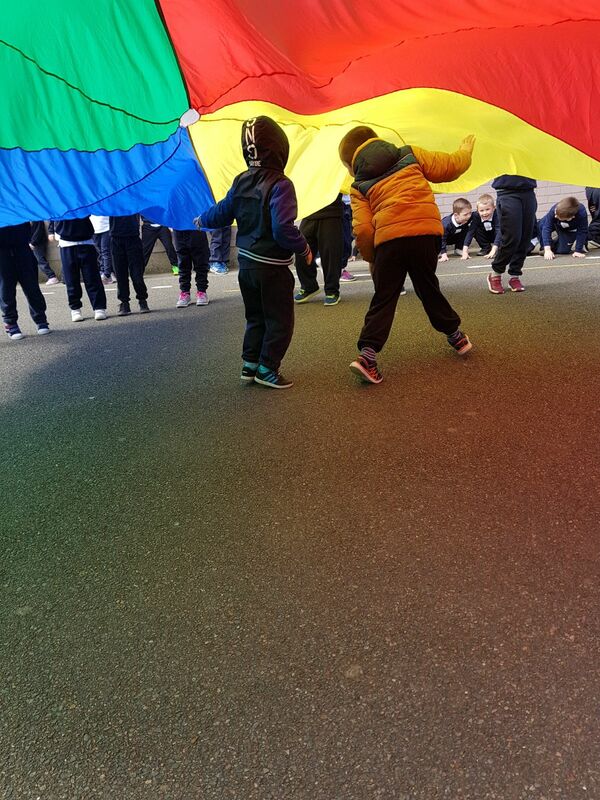 The Active School Flag is a Department of Education and Skills initiative which recognises schools that strive to achieve a physically educated and physically active school community, by awarding them with the Active School Flag (ASF). The programme encourages all schools to evaluate their current provision of P.E. 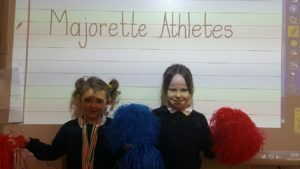 and extracurricular sports activities for the children and increases parents’ awareness of facilities, teams and clubs in our area. This is a non-competitive initiative highlighting the importance of physical activity in and sport in schools and communities in which they are based. Our school decided in September 2017 that we would try for the Active School Flag this year. We have been improving all areas of P.E gradually and feel that this year, we are in the final process. We know that there is still a lot of hard work to be done, but we are up for the challenge. Our first task was to set up an Active School Committee of Teachers. 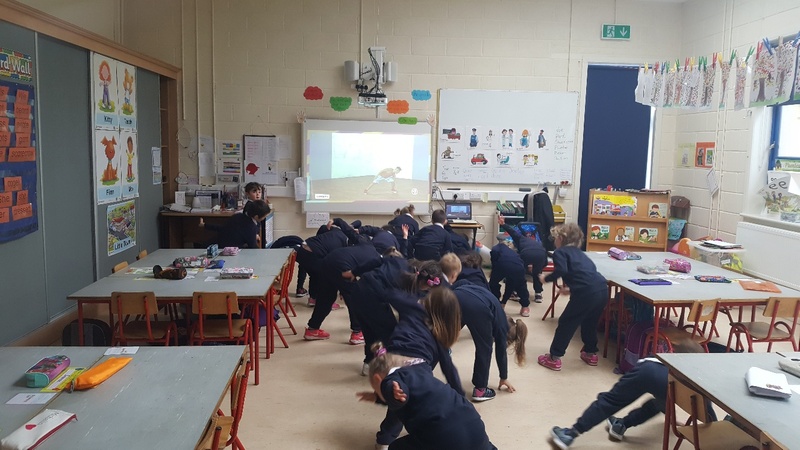 We are very excited about all the new activities and initiatives that will be coming on stream over the coming weeks and months.